The 2018 1oz Landmarks of Britain -Tower Bridge silver coin is the second release in a four-coin collection inspired by some of the United Kingdom's most famous landmarks. Issued by the Royal Mint, the coin features a beautiful reverse design and contains one troy ounce of 99.9% pure silver. It’s an excellent choice for investors as well as a must for any collector of British coinage. Tower Bridge is captured in intricate detail on this beautifully designed silver coin from the UK Royal Mint. The bridge was erected between 1886 and 1894 and it’s a symbol of British engineering as well as an integral part of the London skyline. Arguably the best-known of the city's bridges, the iconic bascule and suspension bridge spans the River Thames near the Tower of London and it's a Grade II Listed structure. 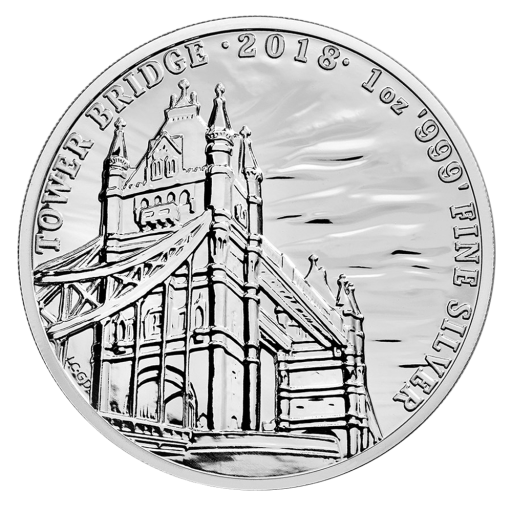 The Tower Bridge 2018 1oz silver coin is the second in the series after 2017's 1oz Landmarks of Britain - Big Ben coin. Artists Laura Clancy and Glyn Davis have chosen to show the bridge at a slight angle allowing you to see both towers, the upper walkways and the lower bridge. The upper walkways have been closed to foot traffic since 1910 but you can walk or drive across the lower section – if it's not open. The coin's obverse features the 'fifth portrait' of HM Queen Elizabeth II by Jody Clark. Thanks to its legal tender status the Landmarks of Britain – Tower Bridge 1oz silver bullion coin is Capital Gains Tax (CGT) exempt. Coininvest.com is pleased to add the 2018 1oz Landmarks of Britain -Tower Bridge coin to its extensive range of Royal Mint bullion coins. Coins are supplied in plastic capsules and insured for fast, safe shipping.